The best horror can often be found right on your own doorstep. Director Simeon Halligan’s Scottish chiller White Settlers proves man’s most basic fears are often those derived from reality rather than the imaginary. 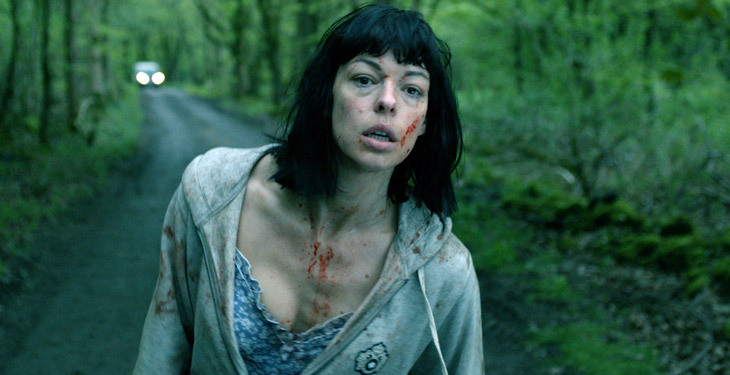 Sarah (Pollyanna McIntosh) and Ed (Lee Williams) have leave the rat-race of London for a new life in Scotland. However, what begins as an idyllic dream in a remote farmhouse soon turns into a frantic fight for survival, as the young couple discover that the locals are not as hospitable as the estate agent’s brochures would have had them believe. The underlying premise of this film is nothing new: outsiders attempting to integrate themselves into a new, often hostile, environment has long been a horror staple. During the 1970s films like Sam Peckinpah’s Straw Dogs (1971) or Robin Hardy’s The Wicker Man (1973), were unflinching in their depiction of how people living in rural isolation reacted with violence to visitors who innocently strayed into their home territory. In White Settlers however the subject is given a topical twist, considering the possible tensions which may arise as the vote on Scottish independence draws near. Though not taking its savagery to the gratuitous depths of the schlockfest Inbred (2011) – where the innocent visitors to a remote Yorkshire village were quite literally made mincemeat of by the locals – here it achieves a realistically unsettling tone, with the violence achieved through more credible means. The fear is also intensified by the fact that it’s never revealed exactly who the perpetrators of the aggression are, or how they’d hope to get away with their plans. As in The Wicker Man, the viewer along with the victims of the outrages, cannot quite believe that this is actually happening in twenty first century Britain. McIntosh and Williams are spot on as their initial sense of enchantment at their new surroundings, slowly gives way to bewildered hysteria when they are forced to fight for their lives against a hostile environment. Before coming to directing Halligan was an art director and set designer, having graduated from The Royal College of Art. A training which shows in White Settlers as he captures both the beauty and wildness of the film’s setting, intensifying the isolation the young couple feel which ultimately leads to their social breakdown. A better tool to deter English encroachment north of the boarder this September you would be hard put to find.